By Issaquah Robotics Society members. Scout is a robot built for the SRS Robo-Magellan, an outdoor autonomous robot navigation contest. See the Robothon web site for the rules of the contest. We currently use a pure dead-reckoning strategy to get near the goal, an 18" orange traffic cone, and then use a camera to find the cone and drive to it. 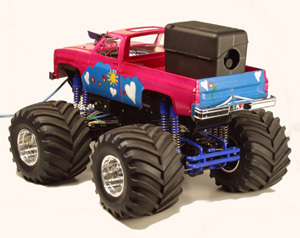 Scout's body is a Tamiya Super Clod Buster, a 1/10th scale RC Monster Truck with four wheel drive and four wheel steering. It has a turning radius of about 4 feet and can handle pretty rough terrain such as grass, gravel, mulch, even fist-sized rocks. We removed the speed controller and replaced it with a Victor 884 from Innovation First. This was probably overkill for this project, but we were familiar with it from FIRST and it can easily handle the current that the Tamiya motors can draw. 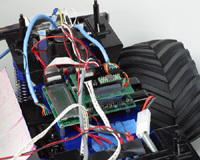 The controller is based on Larry Barello's ARC Board with an Atmel ATMega32. We also added a custom stacked sensor board to interface with sensors and outputs. For software menus and debug info, we added a 2x16 LCD driven by a 74164 shifter chip. To measure distance traveled, we use Hamamatsu P5587 IR photoreflectors. 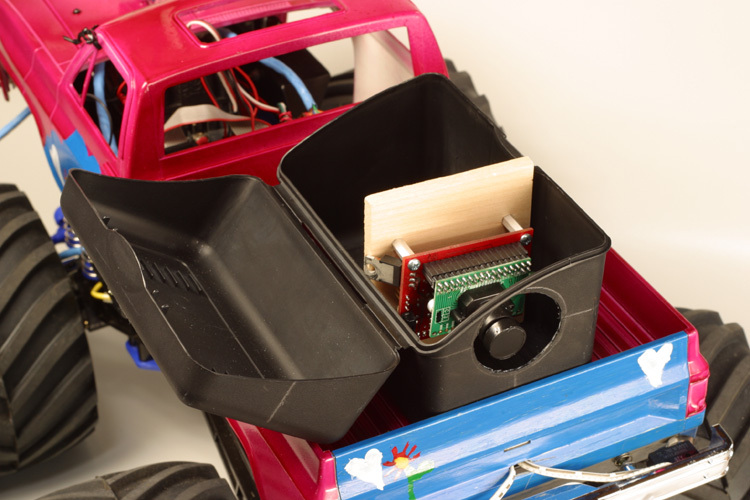 The sensors read 18-segment encoders made from custom-cut acrylic and placed inside the wheels. We used Pololu to cut the encoder wheels and also the sheet we used to mount all of the electronics. To determine our heading we use the ADXRS150EB rate gyro from Analog Devices. The "evaluation board" has the surface mount chip on a small circuit board that can be plugged into a DIP socket, which makes it a lot easier to get running. To find the cone, we use a CMUcam version 1.1. It uses a small, low-res digitial camera and does on board processing to identify areas which match a specified color range. Results are sent to the processor via the serial inteface. It's really good at identifying bright orange, which it sees as nearly pure red. We mounted the camera in a file card box (thanks to John McIvor for that idea) in the bed of the truck, which means we drive the truck backwards! The bumper was modified to hold two touch sensors which tell us when we've bumped into something, which is hopefully the final cone. Our safety switch uses a Sharp solid state relay S116S01 which we found at DigiKey, try part number 425-1227-5. This is really intended for AC applications, which works fine for cutting the power on the output side of the motor controller, but does not work correctly to shut off a DC circuit, so you can't use it to kill the power between the battery and the rest of the system. It requires 20 milliamps at 1.2V, so we put it in series with a 300 ohm resistor so we could use the 7.2V battery to control the relay. We have done some work on using a sonar sensor for obstacle detection, but so far that's not working. Well, it works, but it also introduces a ton of noise on the encoders so we haven't been able to deploy it yet. Stay tuned. Robothon 2004 - "Third" place.